I print on a 1919 10x15 C&P NS, and a Adana 3x5. My wife and I moved to Ukiah, CA at the beginning of 2012 from a tiny apartment in San Mateo, CA. I finally had room for a floor platen press. 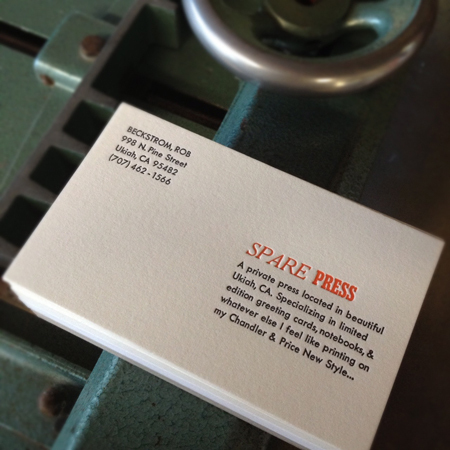 Purchased the press from a printer in Comptche, CA. It sat unused for 25 years. He had a business of printing Redwood postcards, which I discovered had a few from when I was young. I enjoy printing cards and notebooks for pleasure, not for profit.